Raising awareness among parents of English Learners about the importance of biliteracy. The Alas y Voz campaign is designed to raise awareness among parents of English Learners about the benefits of biliteracy so they may choose bilingual programs for their children. For the past 20 years, parents of English Learners have heard that English programs are the best choice for their children. Although they value bilingualism, some do not choose bilingual programs because they are worried that their children will get confused. They believe they can still ensure their children become bilingual by teaching them their primary language at home. Because this is easier said than done, many English Learners end up losing their home language and missing out on the many benefits of biliteracy. 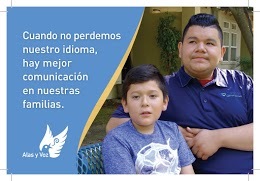 By sharing videos, graphics and stories on social media, the Alas y Voz campaign delivers effective messaging about the importance of bilingualism and biliteracy, including the ability to perform better in school, to communicate better with their family and to access better job opportunities. Designed to help schools, district staff and parents share the campaign with parents. The online toolkit includes the resources needed to share the campaign and its messages through presentations in schools, districts and community meetings. Subscribe to our Youtube channel and share our films.